Boko Haram systemically kidnaps Christian women as slaves, child brides, amid fears of Christian-Muslim civil war. Nigerian terrorist group Boko Haram has been kidnapping Christian women from rural areas and forcing them to convert under threats of death, Mail & Guardian reports. The women are then kept as slaves and child brides - and forced to help the terrorists kill innocent Nigerians. Mail & Guardian brings the story of Hajja, now 19, who was forced to serve as the slave of a guerrilla unit for 3 months. Hajja recounts being forced to cook, clean, read from Islamic texts - and be the "bait" for the terrorists to lure innocent Nigerian men to their deaths. On one mission, Hajja was sent to stand in a field near a village to attract the attention of civilians working with the army. When five men approached her, they were ambushed. "They took them back to a cave and tied them up. They cut their throats, one at a time," Hajja said, in an interview with Reuters. "I thought my heart would burst out of my chest, because I was the bait. "If I cried, they beat me. If I spoke, they beat me. They told me I must become a Muslim but I refused again and again," Hajja told Reuters in an interview. "They were about to slaughter me and one of them begged me not to resist and just before I had my throat slit I relented. They put a veil on me and made me read from the Qur'an," she said. Hajja eventually faked severe illness to escape the terrorists, making herself seem like too much of a liability as they wandered from one secret location to another. According to Hajja, the terrorists lived simply - eating corn, millet and occasionally meat from stolen animals. Armed with AK-47 rifles and pistols stolen from police they killed, the group was forced to move location daily to protect against tracking or police assaults. Boko Haram - which means "Western education is forbidden" in the Hausa language - is opposed to any non-Muslim or western influence in the country, including within its education system. The group is responsible for a hug upswing in violence in the region. Boko Haram is a particularly deadly force in Nigeria, reportedly driving Nigeria's security spending up to 1/5 of its annual budget. The New York Times reported that by early 2012, Boko Haram was responsible for over 900 deaths; the Mail & Guardian report brings the current death toll to 1708. The US designated Boko Haram as a terrorist organization last Wednesday, due to its links with Al Qaeda. US officials say that the group is interested in turning Nigeria, which is a mixed-religion country with over 170 million people, into an Islamist state. Since President Goodluck Jonathan declared a state of emergency in May, Nigeria's problems have been multiplying - including Boko Haram's violence, which continues to steadily escalate. "It's the toothpaste effect: squeeze one end and it comes out the other. They have proven resilient and are adapting faster than the military," a Nigerian security source said. 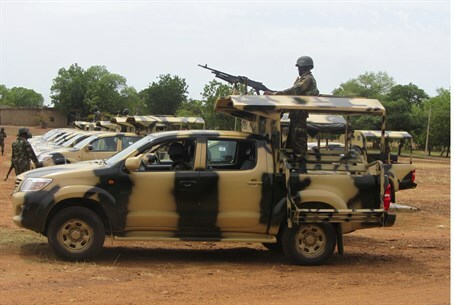 Army commanders denied Boko Haram had any control over the Gwoza mountains: "We are curtailing their activities and I can assure you that ... the insurgency will soon be a thing of the past," Lieutenant-Colonel Adamu Garba Laka said. But a Nigerian general asked Cameroon this month for help in fighting Boko Haram, and the backlash against civilians has made the conflict deadlier than ever. Pushing the conflict into poor rural regions, like Gwoza, where Hajja was seized, runs the risk of radicalising more disenchanted youths and drawing more people into the violence. "Gwoza has disintegrated. We have no schools, no hospitals, no government offices functioning," said local government councillor Michael Yohanna. Yohanna has confirmed that over 12 women like Hajja have been taken by that particular insurgency group, arousing the anger of locals and exacerbating the conflict. "I worry that youths will take the law into their own hands. It will become a war between Christians and Muslims."